French: Moucherolle vermillion; German: Purpurtyrann; Spanish: Sangre de toro. 6 in (15.25 cm). Among the most colorful tyrannids, and certainly the most brightly colored tyrannid in North America. Plumage of males includes bright red crown and underparts, blackish brown tail and upperparts, and dark brown lores and mask joining at nape. Bill is short, broad, flat, and black; legs and feet are brownish black. 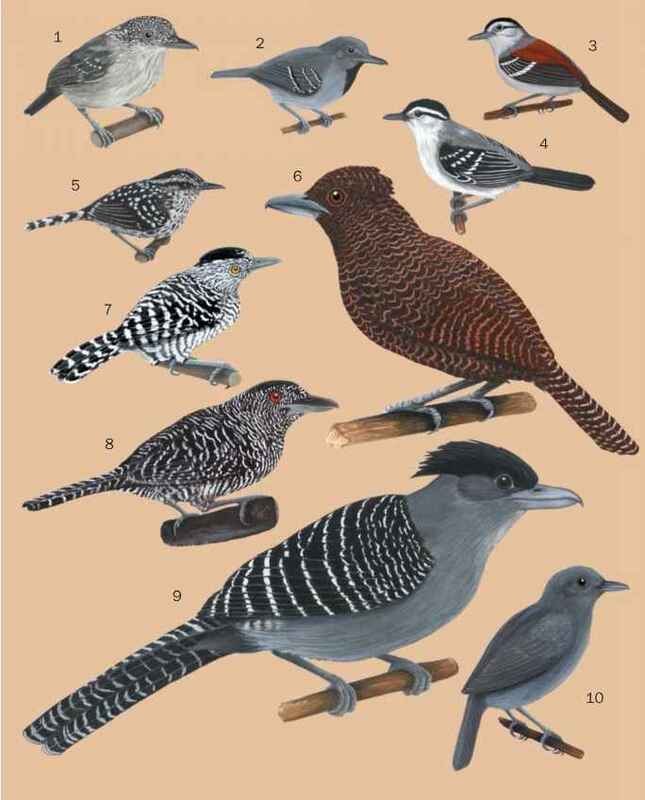 Females have a white chin, throat, and chest, a pale pinkish belly and crissum, grayish brown upperparts, and a thin white supercilliary stripe. The juvenile male is similar to the adult male but more pale; the juvenile female is similar to the adult female but with a yellow wash to the belly and crissum. 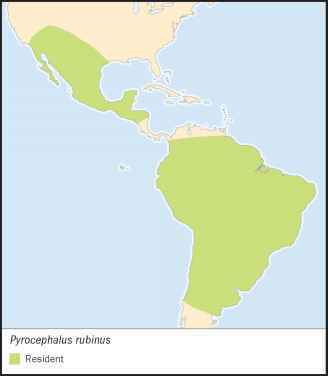 Occurs from the southernmost regions of California, Arizona, New Mexico, and Texas south to Argentina. Desert, semidesert, scrub vegetation, forest edge, open forest, and grassland with scattered trees. Often found near water bodies, such as lakes, ponds, irrigation ditches, and cattle tanks. Lives singly or in pairs. Has a quiet and tame disposition; very approachable. Often chooses a low perch. Wags and pumps the tail. Vocalization follows a pattern during display flight. While in direct flight, the call is a piercing, metallic "pseeup! "; this is followed by a hovering phase with tail spread out and crest erected, which is accompanied by a rapid "pi-pi-li-li-li-sing!" Perches on a low branch, sights prey and sallies forth, hovering to catch it. Returns to the same perch. Sometimes forages on the ground. Feeds on insects, particularly bees. Monogamously breeds twice a year. Cup-shaped nest is constructed by the female in the fork of a horizontal branch or on top of an abandoned nest. Eggs typically number two to four. Female incubates them for 14 to 15 days, and the young, fed by both parents, fledge after 14 to 16 days. Not threatened, though populations in southeast California and Texas declining; cause unknown.